Is it worth it? No. I have felt so bad for the past 2 days. My stomach hurts. I am all bloated feeling. I got a couple zits on my face now. I struggle with a low grade headache. Jogging today was like carrying around an extra 100 lb sack of lead weights. I feel bad all around because of what I ate 2 days ago. I went to a giant industrial food, drink and entertainment emporium located in Nashville 2 days ago. This is a place I would not normally go to, but it is where one of my friends wanted to go for a going away party. This place has arcade games, soda, mixed drinks, beer, and a very extensive menu of trans-fatty, corn syrupy-sugary, monosodium glutamate-salty American fare in huge portions. I didn't eat much before going, I ate a small amount of seared tuna and salad greens for lunch, so I could indulge in this American fare. I ended up eating spinach dip with tortilla chips, fries and fried buffalo wings with diet cokes to wash it all down. All the food was made in industrial production plants with a bunch of additives. This food is designed to be addictive, and appealing in away to make people crave the food. The deal is, my taste buds and mind has been conditioned to crave the flavor of these industrial made products. According the Michael Pollan, the USA food industry made it so lots Americans would love (crave) the taste and texture of these American favorites. The food industry has figure out how to make food more appealing, and make foods that just slide down quickly, so you will eat more before you realize how full you are. The chicken wings I ate have a fatty, slight crunchy outside for that pleasing texture, but the flesh of wing meat was grown to be soft and needing only one or two chews before it is a texture to be swallowed. The spinach dip was cheesy and fatty and liquidy enough that it too could just be swallowed without necessarily registering anything but the salty taste and oily texture. I want those wings, and hot dips of the American industrial food makers as much as a smoker wants a cigarette or an alcoholic wants a drink. When confronted with these industrial made products, I will take them and eat them like there is no tomorrow. David Kessler writes about the industrial food industry making food so irresistible that he, myself and many people just cannot resist these foods if put in front of them. Contrary to the American industrial foods, is how I ideal would like to eat at home. I strive to have good wholesome foods at home, but I am not always successful because I love those American foods, chips, dip, wings, chocolate cream filled cookies, and lots of white pasta. But, I do strive to have a locally grown ingredient in everything I make. That means there usually a locally grown veggie in every dish made in my home. I like Michael Pollan's idea of eating junk food is ok, as long as you make them. French fries and potato chips are a pain in the but to make, so I won't make them. Popcorn in my house is made the old fashioned way in a heavy bottom pot on the stove top. Butter on my popcorn is butter I churned from cream (from grass fed cows) in my house. Like an addict (which I am) to these American industrial made foods, I generally stay away from them. I steer clear of chain restaurants, and this industrial food emporium on a regular basis. Because I usually steer clear of these industrial restaurants, my body doesn't know how to handle edible industrial products filled with additives, fat, salt and corn syrup. I must remember how I felt for the past 48 hours because I feel and felt aweful from head to toe, and do all that I can to steer clear of this type of food. Hurray! I am in, I slid in right at the possible moment before being tagged out. I am in the Bells Bend Farm CSA!!!!! YAY!!!! My former CSA - Hungry Gnome Farm can no longer provide a CSA do to a few factors. I will miss the HGF CSA, but I am happy to remain friends with the farmers behind the HGF. 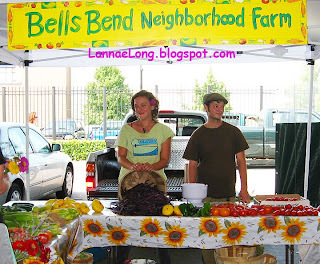 HGF suggested some other options for me and one of them was Bells Bend Farm CSA! YAY! I had met Eric and Brooke, really wonderful and friendly people who have started a really great movement to farm in the Bells Bend area of Nashville. The farmers at Bells Bend have learned a lot from the those who have come before them including HGF, so I am excited for May to come and we can start eating Bells Bend Farm fresh food! I gotta say, I have a few requirements for making a CSA a part of my life, an extension how I do things, and something that is effortless as if I have always been in partnership with my food source. I really want a farm in Davidson County, or just over the border. I really want my food to be local. I want the CSA to drop off food at my house, downtown near my office, or on the weekend when I feel like I have the luxury of time to pick up my food. I also have been holding out for CSA protein like eggs. In years past, Hungry Gnome fit the bill. I never thought I would find another CSA that would fit my life like Hungry Gnome. Well, Hungry Gnome steered me towards Bells Bend Farm, and they can deliver to all my particular needs. The farm is in the Nashville area, they have a Saturday delivery day, and they have an egg option. I cannot be more thrilled. Yay! Thanks Bells Bend Farm! Love ya already! There is a down and dirty diner in the Nashville, and it is the Hermitage. It is not to be confused with The Hermitage, or The Hermitage Hotel, it is the Hermitage Cafe. The Hermitage Cafe (really a diner) old institution is the quintessential diner with a nice butter flavor to all that is fried on the griddle. I lived in Phila, PA for about a decade, and Phila and Southeast PA were the home of the diner and diner food. 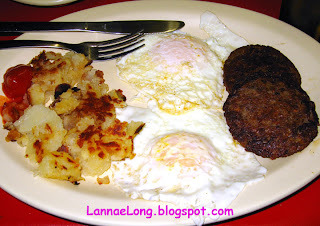 When I lived in Phila, me and my friends often turned to the diner for comfort foods, for late night food, and for the scrapple offer to the out of town guest. Oh, the diner, the greasy spoon, the chuck wagon, how I have missed you. It seemed that the PA diner food was always reliable, you knew what you were getting, and I could count on it time and again. There doesn't seem to be that tradition here in Nashville. Nashville may be famous for the Meat and Three, but it is not necessarily a substitute for a good greasy spoon. 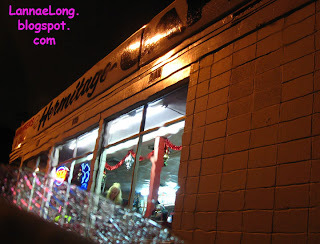 That is why I am very happy that I finally tried the Hermitage Cafe, a true diner. As mentioned above, this is a down and dirty place. Well, maybe not dirty, but a very well worn diner. As I imagine the Hermitage Cafe over all the years, the floor is well worn by many happy late night revelers walking in looking for a breakfast meal to sop up some of the revelry beverages they partook in on 2nd Ave. The seats and tables are well worn by hard working 2nd and 3rd shift employees looking for some comfort food before heading home or heading to start their shift. The counter is well worn by hungry music row support staff working to help singer and song writer wannabes make it big. The cook and the waitress have been around for a long time, and they have seen it all. The waitress and cook who are on at 10:30 pm know their regulars, and the cook gets the eggs and toast going, and the waitress gets the coffee and juice beverages on the table just as her regulars sit down. The cook and waitress are the stuff of lore, you just cannot make up these people. They are larger than life. 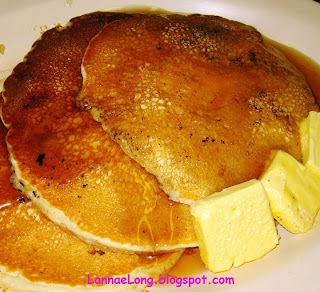 They make my local diner, the Hermitage Cafe, what it is. As I age, I have become more of a homebody. When I get home from work and the gym, I am more likely to stay home. But, one night recently, even though tomorrows work day was creeping ever closer, I decided to go meet up with some 2nd shift friends, and regulars at the Hermitage Cafe. The waitress was glad to see them, knew their beverage of choice, and knew the plates they normally order. They gave me the lay of the land. I opted for the special breakfast plate. The special breakfast came with hash browns, 2 eggs, 2 meats (sausage or bacon), 2 biscuits and a bowl of white gravy all for less than $6. They got an omelette with bacon, and pancakes and bacon. Everything came out cooked to order by the seasoned short order cook. I commend the cook because it does take talent to make a nice over easy egg. For me, a non-short order cook, I would say I break yolks about 50% of the time when I try to make an over easy egg. It is amazing that this cook makes over easy eggs with out breaking the yolk nearly 100% of the time. My whole meal had this butter flavor that seems to be synonymous with the grease used on the griddle at a typical diner. It was nice to visit with friends I don't get to see because they are working when I am off from work, and they are getting ready to socialize when I am turning in for bed. It was nice to have that old home town diner experience I long for. It was very comforting to be at this diner. Happy New Year of the Tiger! Rawr! Today is Chinese New Year, also known as Lunar New Year. It is a great day to re-look at Solar New Year's resolutions that may have fallen off the edge, and pull them back in. It is like an official re-do. May your New Year of the Tiger be happy, healthy, and prosperous. 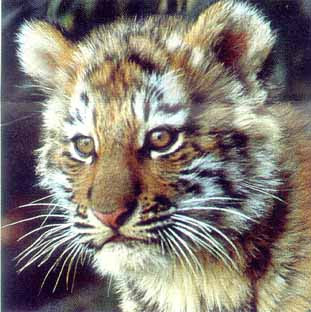 This is a photo of a tiger cub at the Indianapolis zoo. This photo is from the http://indianapolis-zoo.visit-indianapolis.com/ website. 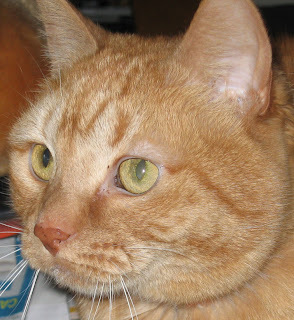 This is a photo of my personal little tiger who lives at my house. This photo is from Kitty's website http://kitikata.blogspot.com. The name Cabana reminds me of the Barry Manilow song Copacabana, the hottest spot north of Havana. I actually liked that song as a kid, it was fun listening to it and jump around the living room to the beat. I actually just played the song again right before I started typing this. The Copacabana Club in New York has this jaunty tune playing while one views the photo gallery, menus and services available. Again, I could not resist getting up from my chair to do a few turns and disco poses while the song was playing through my computer speakers. Listening to the song just took me back for a moment to my childhood in sunny So. L.A., CA, when I didn't have a care in the world. So, going to the Cabana restaurant during restaurant week was an all around great surprise! I had not gone to Cabana before because of wrongful notions about the place. I had wrongfully thought Cabana might be cheesy like the Copacabana song, it was mostly about the bar drinks and not the food, that it was all about the singles scene, and the food needed a lot of help. I was wrong, wrong, wrong. Cabana is not cheesy. There are really interesting seating areas for larger parties of 8 - 10, as well as smaller tables out of the hub-bub for 2. There is nothing cheesy about the interior. Cabana does have a good list of mixed drinks to offer, but it is not only about the drinks, there is a nice balance between fun creative bar food, entrees and the bar. I wouldn't say that Cabana is all about the singles scene either. Rather I would say it is a good place for gatherings to get together after work, after a round of golf, or just to get together. The biggest nice surprise is that the food was really tasty! We went to Cabana during restaurant week because all the other places we wanted to go to were already booked. I did not know what to expect. I was not expecting good service because in years past, servers seemed to exhausted, "over it already" and almost put out by restaurant week. That was not the case at Cabana. Our waiter, although serving many tables, seemed to be on top of his game, got all the food, drinks and water out in a timely manner. There were people around us not doing restaurant week, so they were getting food off of the regular menu and off the regular drink menu. During restaurant week, we ordered the crab cake, puff pastry baked brie, pork tenderloin with sweet potato, and wild mushroom and gnocchi with truffle cream. 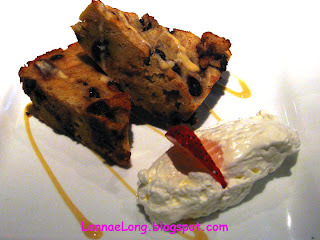 For dessert was bread pudding. The crab cakes are generous, and made with lots of crab, not filler. The crab cake is quite possibly the best crab cake I have had in Nashville thus far. 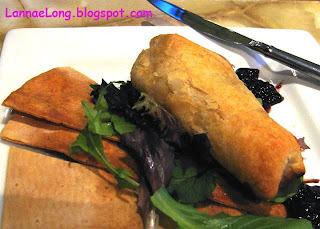 The baked brie was a nice slice of brie wrapped in pasty dough, and served with mixed berry preserves and really wonderful lavosh crackers. The combination of flavors and textures, again, was a happy surprise to me. The plating was visually pleasing, and the taste and texture were solidly good. When our entrees came, we were again pleasantly surprised! The gnocchi with mushroom and truffle cream was rich and umami. I took 1/2 home with me to enjoy again at lunch the next day. 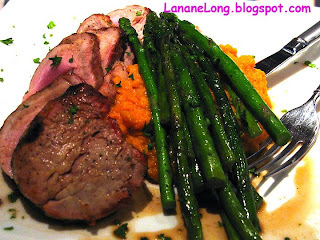 The pork tenderloin, sweet potatoes and asparagus also a winner. The aroma from the pork was so inviting, the pork was tender and went very well with the sweetness of the sweet potato. All in all, this restaurant week experience did its job and made me make arrangements to go back again as quickly as I could with a lot of friends. I had to "share my find"! So, a couple weeks later after restaurant week, I arranged for an outing with 8 of my gal pals on Wednesday. Wednesday at Cabana from 4:00 - 10:00 pm is Girls Nite Out with all house drinks, house wines, special martinis, and most appetizers being $3. That is right gal pals out there, on Wednesday evenings, mix and match 5 drinks and apps, add tax and tip, and you are only paying $20. Our house wine pours were generous. The apps are very generous plates, all normally $6 - 10. Me and my gal pals got white bean humus, homemade potato chips with blue cheese, french fries with cheese sauce and ketchup, crab cakes, fried green tomatoes, chicken biscuits, country ham biscuits, tomato soup and grilled cheese, and BBQ pork wontons. Each app plate was more than enough to share with 8 gal pals. We all really liked the BBQ pork wontons a lot because the filling was delicious and the sorgham creamed corn sauce it came with was just super delicious. We ordered a 2nd plate for the table. We were so stuffed. My suggestion is to limit the number of apps to 2 per person because each plate has a lot of food on it. We all made this a meal, and we all were stuffed by the time we left. Another benefit to Girls Nite Out is that it easy on the wallet. When we all opened our check, we all were gasping in joy because we all were expecting to pay more than what was on the bill. One gal pal who came late, had only 2 drinks, had a bill of $6. Amazing huh!? We all were happy with the low cost bill and the very fun and tasty food we had. We all left saying we need to do Girls Night Out again.